Cambodia has an emerging economy with a relatively high economic growth averaged at 7.8% (2003 – 2013), the fifteenth highest average GDP growth. Strong textiles, agriculture, construction, garments, and tourism sectors led to foreign investments and international trade, their major exports are rice, fish, timber, garments and rubber. Over the years, tourism has been Cambodia’s fastest growing industry, with arrivals increasing from 780K in 2002 to over 3.5 million in 2012. In March 2013, the inflation rate was reported at just below 1%. Based on International Monetary Fund (IMF), it is projected that Cambodia GDP growth will grow to 7.2% in 2014. Cambodia, bordered by Thailand, Laos and Vietnam, is the 70th most populous country in the world. Cambodia shares borders with two larger and more developed economies in Vietnam and Thailand, enabling it to benefit from the close ties between the countries. It is also situated within close proximity of the leading global economies of India and China. Cambodia also has the benefit of access to maritime trade due to be located in the Gulf of Thailand. Approximately 90% of Cambodia’s population is of Khmer origin and speak the Khmer language, the country’s official language. Cambodia’s population minority groups include Vietnamese (5%) and Chinese (1%). The country’s population growth rate is 1.7%, significantly higher than those of Thailand, South Korea, and India. Rice is the staple grain, as in other Southeast Asian countries. Fish from the Mekong and Tonle Sap rivers is also an important part of the diet. The supply of fish and fish products for food and trade in 2000 was 20 kilograms per person or 2 ounces per day per person. Internet service in metropolitan areas is less expensive than in rural areas. Recent improvements to internet connection technology and competition have resulted in improved internet access in Cambodia. English language literacy rates in Cambodia impact the use of the internet as the majority of sites are in English, not Khmer. Tourism is one of the major sectors supporting the Cambodian economy and it is this sector that Cambodia provides opportunities to attract foreign investment. Last year, foreign tourists were up 24% year-on-year, and generated total revenue of over $2 billion. Eco-tourism and cultural based tourism offer vast potential via hotels, golf courses and other amenities. The lack of infrastructure (transport) and high standard services for the high class, or sport tourists (such as golf) presents vast opportunities for investors. In addition, investment in the construction of hotels, resort centers and restaurants are encouraged. The Cambodian government has implemented measures to ensure the safety of tourists, constructed infrastructure and tourism facilities to develop and preserve their cultural heritage. 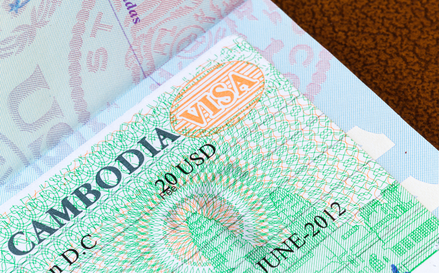 Cambodia was also the first country in Southeast Asia to introduce an e-visa. This provides great convenience for the tourists. Tourists can obtain visas at border checkpoints and at international airports. Investment in agriculture, such as organic farming and agro-processing is another sector that is appealing to entrepreneurs wanting to set up a company in Cambodia. Flat land, access to rivers and their tributaries and the highly capable and relatively cheap workforce, Cambodia has potential to be a significant agricultural net exporter. Investment in basic physical infrastructures such as irrigation or rural roads will help this flourish. Although foreign investors cannot own land, Cambodia offers 99-year leases to foreign investors for long-term use, and there is also partial ownership option by joint venturing with a local partner who owns 51% of the company. Other industry sectors with great potential include fisheries, rubber processing, sugar processing, jute, palm oil refineries, and all kinds of tropical fruit and organic fruits and vegetables. Company registration in Cambodia can be difficult for foreign investors because of complex government licensing procedures. However, it can be done through a professional services firm specialized in offshore incorporation in order to ensure a smooth process and compliance with the law. Cambodia does not require foreign businesses to have Cambodian partners, and companies of all kinds may remain with all shares in the hands of the founding individuals or corporations thus ensuring that profits remain with them. Having a Cambodian partner can have its advantages, however, particularly given a local partner’s understanding of the language and business culture, and the likelihood of them having local connections. There are 26 ministries within the Royal Government of Cambodia which collectively regulate a broad range of industry sectors and other activities. A publishing company, for instance, would need a license from the Ministry of Information to incorporate in Cambodia, where as a business targeting foreign tourists would need permission from the Ministry of Tourism. The Ministry of Labour (MoL) should also be contacted and provided with a Declaration of the Opening of a Business, prior to business registration, or within 30 days of commencement if the business less than 8 staff. Healy Consultants Group PLC offers a range of Cambodia business startup services including managing the company registration process along with the business support services such as accounting and taxation, applying for work permits, open a corporate bank account etc. Cambodia is one of the Asian jurisdictions with great potential for entrepreneurs understand doing business in a developing economy, and in Asia.